Last week, A was cycling up to Yonge and Bloor, and doing what cyclists do, deciding as she went if the traffic lights were to be taken at face value or not. Unfortunately, just at the point where the lights were red and not a vehicle in sight, and just where she decided the lights were not be taken at face value, there appeared the traffic police, as if out of nowhere. The officer slapped her with a $325 fine. Ontario Highway Traffic Act (HTA) 144 (18), failure to stop at a red light. And, as she was told, 3 demerit points. After she had informed him at length of the unfairness of treating bikes like cars, he kindly reduced it to failing to stop on amber, HTA 144 (15), $180. Poorer, somehow wiser, somehow frustrated, she went on her way. A fine of $180 is one thing, but those demerit points. For a cyclist without a car, it’s hard to make sense of that one. It turns out she doesn’t have to. Section 56 states: “The Lieutenant Governor in Council may make regulations providing for a demerit point system for drivers of motor vehicles or of streetcars.” This means that if you are on a bike, there are no demerit points. Which is nice, but there’s something about the concept of fining cyclists as if they were in motor vehicles that defies comprehension. Is it the unfairness of pretending our bikes are cars when it comes to traffic violations, but not when it comes to the way we can use the road? And what exactly are we allowed to do on the roads? The HTA states that slow vehicles must ride as far to the right as possible, which sets cyclist up for sideswiping by carelesss right-laners (and in many downtown situations, the right-laners are by definition in more of a hurry and more willing to take risks). So until the law can look at cyclists from the seat of a bike, and not from behing the tinted windows of an SUV we have little choice other than obeying the rules of the road, while making up the details of these rules as we go along. Just hope the unmarked car is watching with sympathetic eyes. This entry was posted on Friday, April 20th, 2012 at 9:56 pm	and tagged with demerit points, fines. red light, Ontario Highay Traffic Act and posted in Uncategorized. You can follow any responses to this entry through the RSS 2.0 feed. 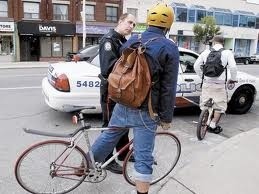 There’s precious little sympathy for cyclists in Toronto.